On Saturday night we had the formal celebration of my twenty-fifth anniversary of priestly ordination, which occurs this Tuesday, June 28. Archbishop Miller presided at Mass for the feast of Corpus Christi, followed by a dinner in the parish centre attended by many parishioners and dear friends. The following is what I wrote in the program for Mass. Just about everyone knows that I choke up when I count my blessings, so it should come as no surprise that I can't express personally my gratitude to the people who have shaped my life, guided me to the priesthood, sustained me in my labours, and brought me so much joy. These written words will have to do, but they come directly from my heart. A verse of Scripture keeps running through my head : How can I repay the Lord for His goodness to me? And how can I repay so many of you for the years of love, prayer, support, and friendship—not to mention forbearance? The simple answer is that I can neither repay, nor fully acknowledge, the many people who have made my twenty-five years of priesthood so happy and so blessed. Some names, of course, must be mentioned. After God, my parents were the source of my vocation and the force that sustained it. Some years ago I wrote my vocation story for a Catholic paper, and Mom mentioned (without complaint) that she and my father seemed to play a fairly small role! I promptly wrote a second article—my failure to highlight my parents was simply a failure to state the obvious. Their sturdy faith, reflected in our regular attendance at Sunday Mass, involvement in parish activities and devotions, was the foundation of all that I am as a Christian and a priest. On this feast of Corpus Christi, I also cherish the memory of my mother taking me to Benediction as a youngster; I've often thought that my love of the Eucharist first began to grow during those evenings. My parents' beliefs and commitment are reflected in the fact that my four siblings all practice the faith; they and their spouses have been to me both a strong support and a fine example of family life; the love of my nieces and nephews has meant I never felt deprived by not having children of my own. Much to my surprise, I am not especially grieved that my Dad is not here to share this anniversary with us—because I believe he is sharing it. 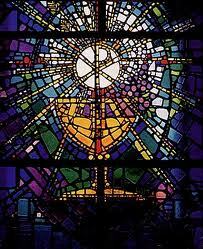 The Eucharist we celebrate tonight bridges the gap between this world and the next, and I very much feel his presence. Thank you, Dad, for everything. Of course my parents were themselves the product of wonderful families, and tonight I can't but think of the love and faith of my grandmothers, great-aunts, great-uncles, aunts and uncles. It's a special joy to have my father's sister Denise with us tonight, the last of that large group of beloved relatives. Blessed as I am by my family, I hardly deserve the further blessing of a small army of friends who have enriched my life not only in Vancouver but in Rome and Washington. I don't have words to describe the love and loyalty of my devoted friends, many of whom go back more than the 25 years we're celebrating tonight. Though I am dodging the risk of naming names, it's impossible not to mention Sister Josephine Carney, who throughout my priestly life has been a constant "voice" telling me of the Lord's love, and Maria Micallef, who when I arrived in West Vancouver decided I needed more of a mother's love (and cooking) than I could get long-distance from Ontario—and who now shares her loving kindness with my mother as well. And I'm sure I offend no-one by singling out Lawrence Pillon and Father Stanley Galvon, the two stalwart friends who have kept me on an even keel since seminary days (or who, at least, did their best!) and my fellow jubilarian Father Don Larson, whose friendship and wise counsel has been a gift since the day we entered the Beda College together. To the rest of you—and you know who you are—I can only say that I can't imagine life without you. Your affection, example, faith, guidance, generosity, and support is a major reason why my years of priesthood have been fruitful years of peace and joy. Of course there would be no anniversary to celebrate tonight had I not been encouraged in my diocesan vocation by Father (now Bishop) David Monroe, who preached at my first Mass and will graciously preach again at the anniversary liturgy on June 28. There would certainly be no anniversary had I not been called to the priesthood by the late Archbishop James F. Carney, and prepared well for ministry by the priests and sisters who staffed the Pontifical Beda College. Women religious—the Franciscan Missionaries of the Divine Motherhood at the Beda, the Grey Sisters of Pembroke, the Sisters of St. Joseph at St. Patrick's, the Cenacle Sisters, the Sisters of St. Ann, and more recently the Dominican Nuns at Queen of Peace monastery—have been a constant inspiration and source of friendship in my priestly life. The Oblates of Mary Immaculate played a key role in the early development of my vocation, and the close friendship and constant encouragement of the late Father Brendan Megannety was a precious gift from God for which I will be grateful forever. I owe a great debt also to the Jesuits, having received both high school and doctoral diplomas from their schools—about 35 years apart! The Benedictines at Westminster Abbey and Mount Angel Abbey have offered me spiritual guidance and example along with treasured friendships and peaceful oases for prayer and rest. The friendship and spiritual wisdom of priests of Opus Dei has also been a big help in recent years. The dedicated people with whom I worked at 150 Robson, and the parishioners at St. Patrick's, St. John the Apostle, St. Ignatius and Star of the Sea parishes, supported and encouraged me for nearly twenty years; many of them are my close and valued friends. This long litany of thanksgiving should help to explain why I have been so happy during the past quarter-century. Yet I have never been happier than I am now. For this, I want to thank the parishioners of Christ the Redeemer. What can I say to express my appreciation to you? Sharing your joys and your sorrows has been the greatest of the many privileges of my priestly life. Since arriving here as pastor, I have often felt like the middle-aged man who became a father for the first time: elated, even if a bit exhausted. I thank you, dear parishioners, for your astonishing generosity, acceptance, confidence and love. If I am a good pastor, it is in no small measure because you have taught me how. And a special word of thanks to those who worked so hard organizing the liturgies and dinner for my anniversary. You are certainly exhausted, but I hope you are elated as well. Finally, a word about Archbishop Miller. I've been blessed to serve under four bishops, all of whom I admired and loved. The first three were fathers to me. Archbishop Miller, though no less a father, has been a brother as well. His fraternal kindness and understanding have greatly eased my recent sorrow. For that and much else I am deeply grateful to him. Thankful to have been ordained a priest during the pontificate of Pope John Paul II, I will close with words from the psalm proclaimed at Mass during his visit to Vancouver in 1984: My soul give thanks to the Lord, all my being bless his holy name. My soul, give thanks to the Lord and never forget all his blessings. Msgr. Smith, you are far too youthful to be twenty-five years ordained! Surely you have miscalculated? Congratulations & blessings. All your friends give thanks and praise to the Lord this day for your kindness, generosity, and Christ-like friendship & ministry. Hello Msgr Greg, Congratulations on your anniversary of the priesthood! As someone celebrating the tenth year of ordination, I look to you as an older brother and model of the priesthood who has lived his ministry with great joy and gusto. Wishing you many more years of blessings and spiritual fruitfulness.